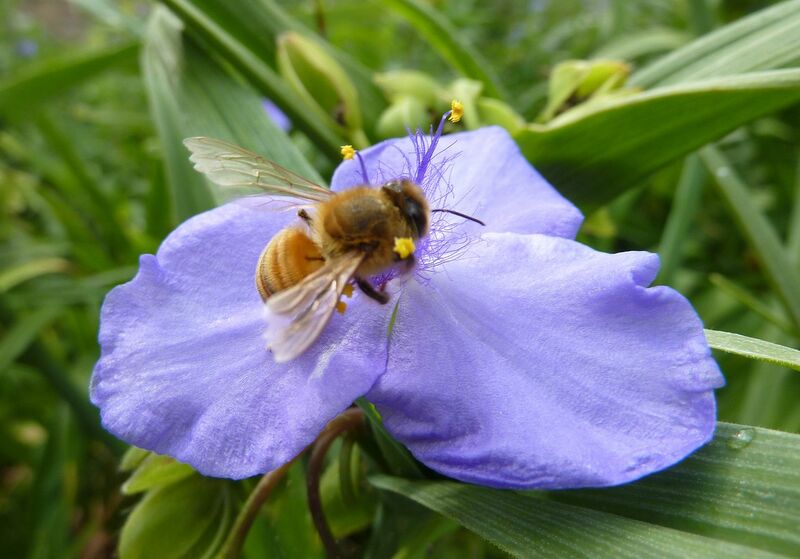 The second half of the meeting was devoted to Gardening for Pollinators. So naturally our hostess had a good pollinator garden setup. 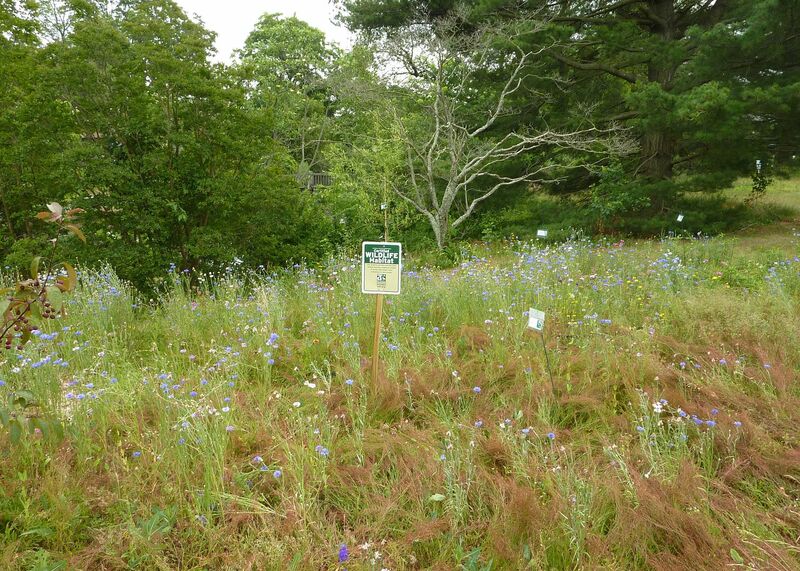 Let me start by saying how hilarious placing this sign in a patch of Bachelor Buttons is. Bachelor Buttons, aka Cornflower (not Coneflower) are a common road side weed. Other members of this genus are called knapweed. Very few are native, and the majority are invasive. This isn't the worst invasive and to her credit it was being controlled. Her property is located in the middle of farm country and apparently they hose down the road sides with Round Up annually. I'm not kidding, they just hose down the road sides with this stuff. It helps control weeds and keeps farm crops that would otherwise spread wildly under control. Signs all over her gardens had them marked as Don't Spray and Don't Mow. There were several patches of this flower about. The sad truth right now is we're in a bit of a low point. There are very few late spring flowering plants, and only a hand full of early summer flowering plants that are native. Filling the gap with a few nonnatives is acceptable I suppose. 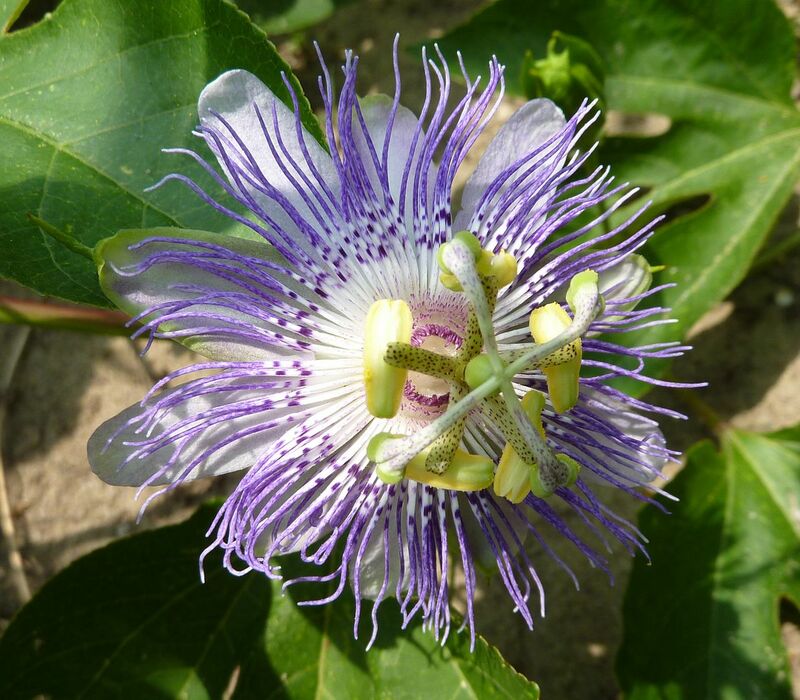 Passiflora incarnata (our native passion flower) was growing like a weed on her property. Carpenter bees I think are the ideal pollinator for this plant but I didn't see any around. 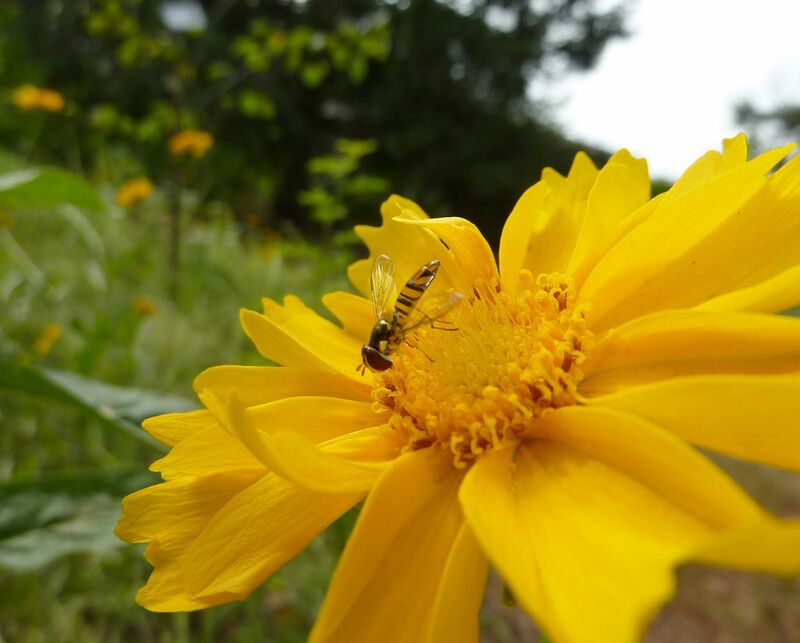 Coreopsis were blooming all over the yard. 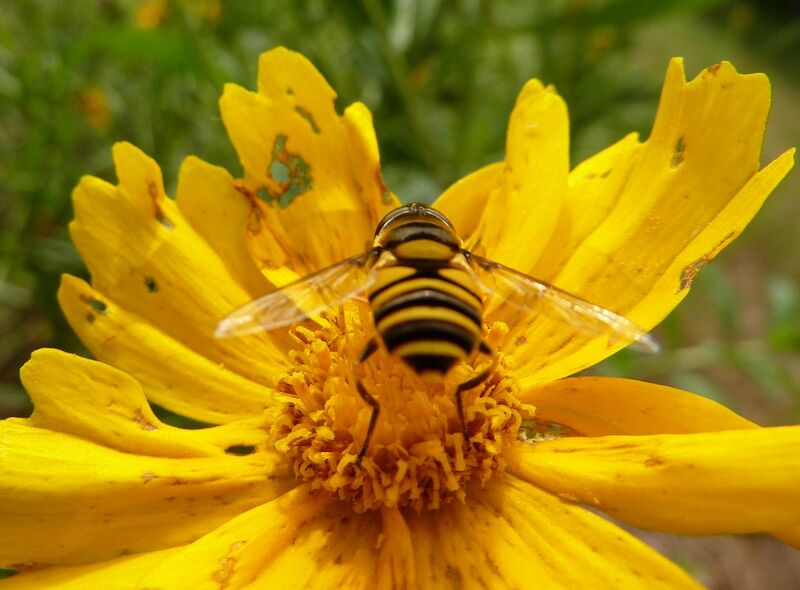 And were the perfect draw to the hover fly. 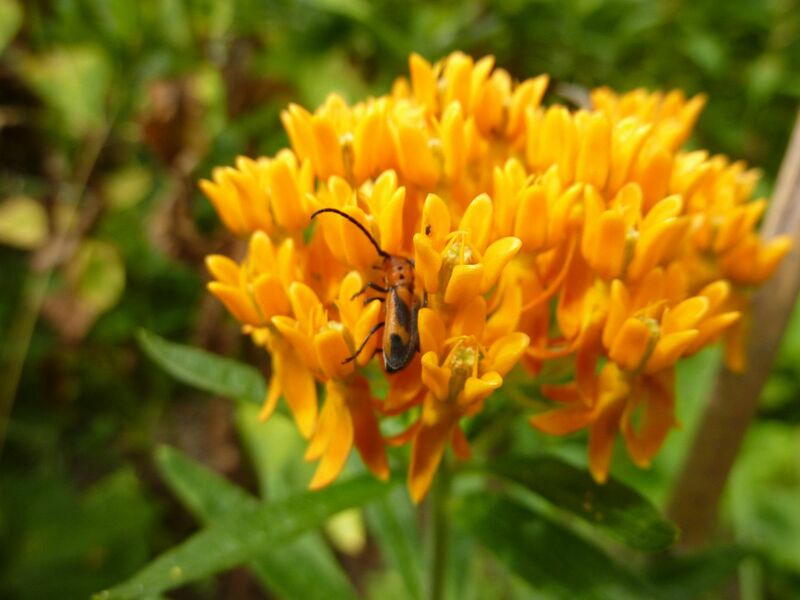 These beneficial insects double as both pollinator and pest control. The larval stage eats aphids. 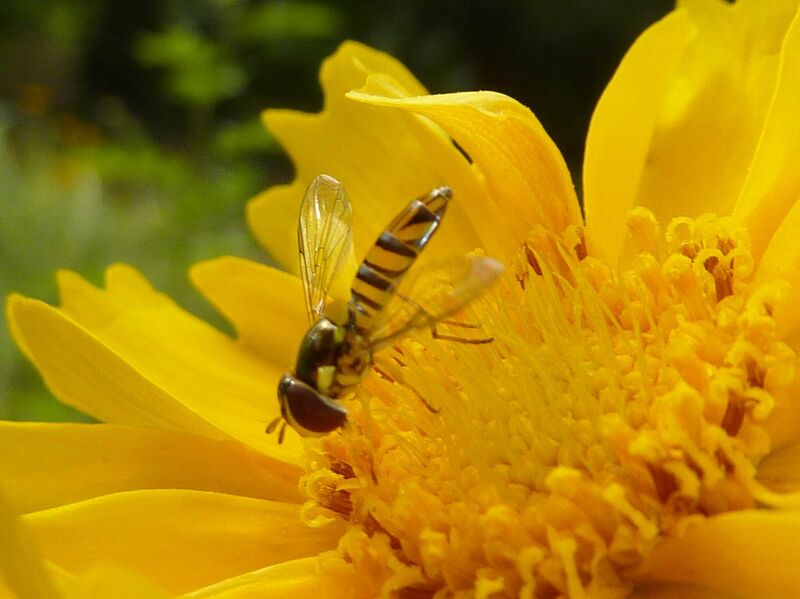 A Flower Fly on a Coreopsis that's seen better days. 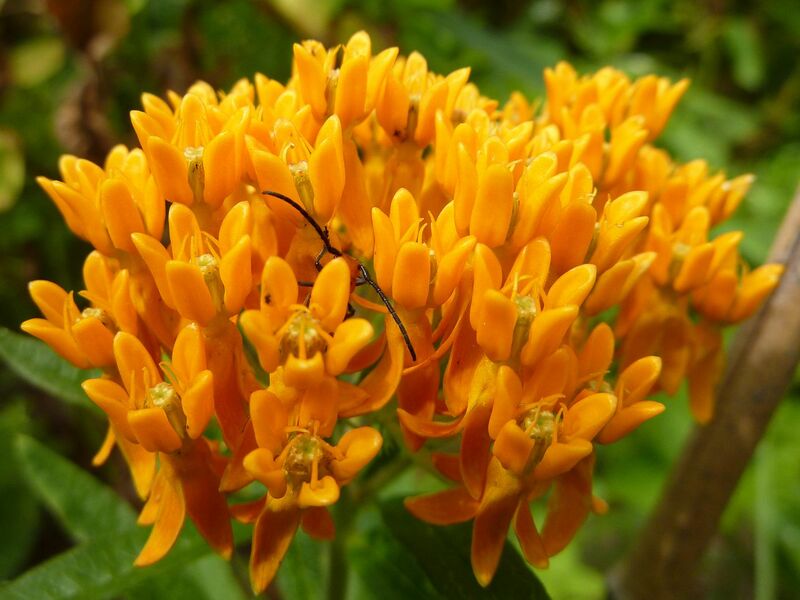 Milkweed is my favorite flower I think. There's just something about the little fangs that I love. A number of plants were scattered around the yard. There was even a patch designated as a Monarch Rest Stop. 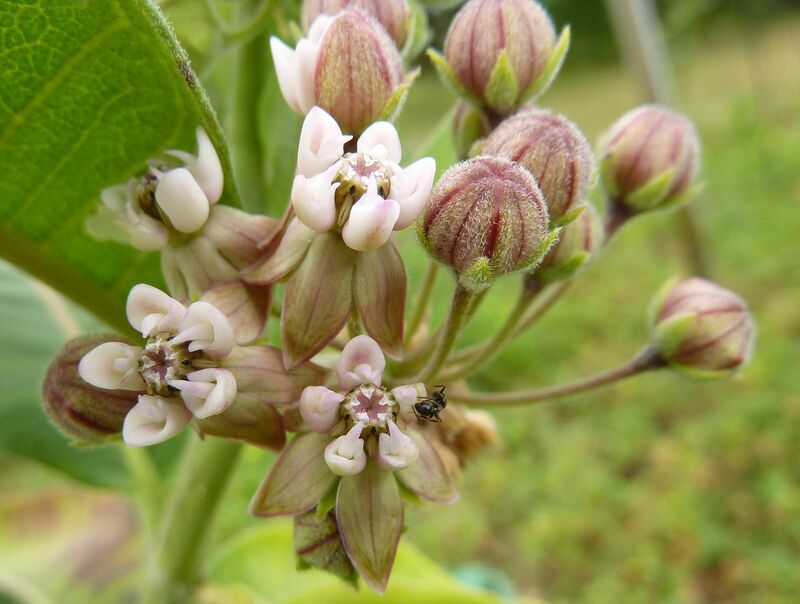 Common Milkweed, Asclepias syriaca, was sort of blooming. You can really make out the fangs on these slightly larger flowers, and they're fragrant too! The only issue with this garden was most of the plants were considerably young. They only had one cluster of flower if any at all and none were taller than 18 inches. I didn't see to many fall nectar sources either. 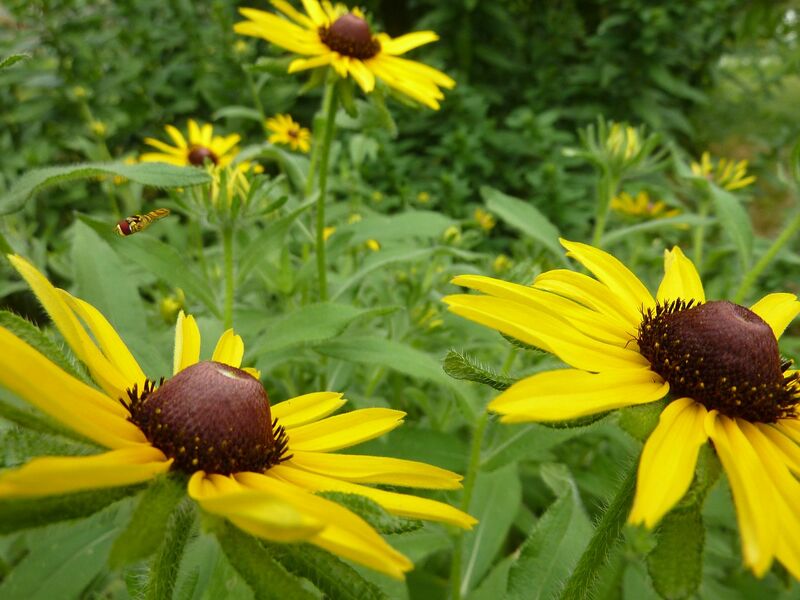 Black-Eyed Susans were also in bloom. 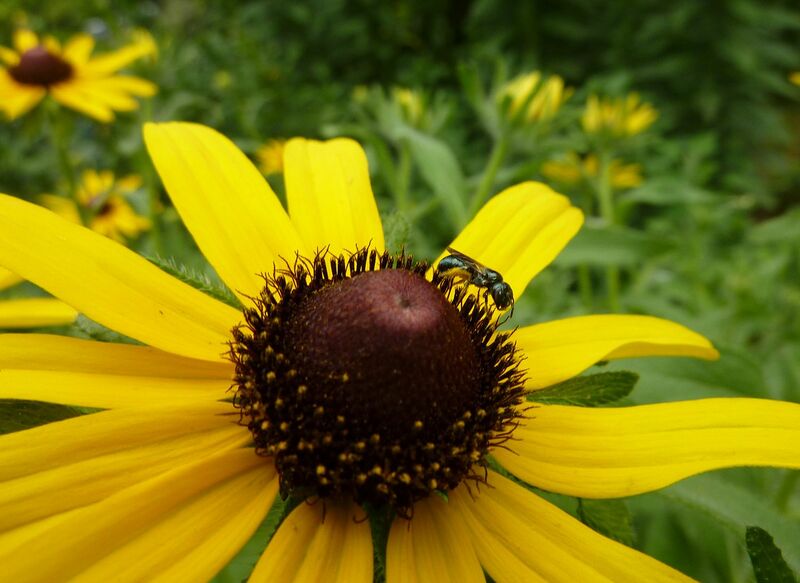 Rudbeckia hirta. 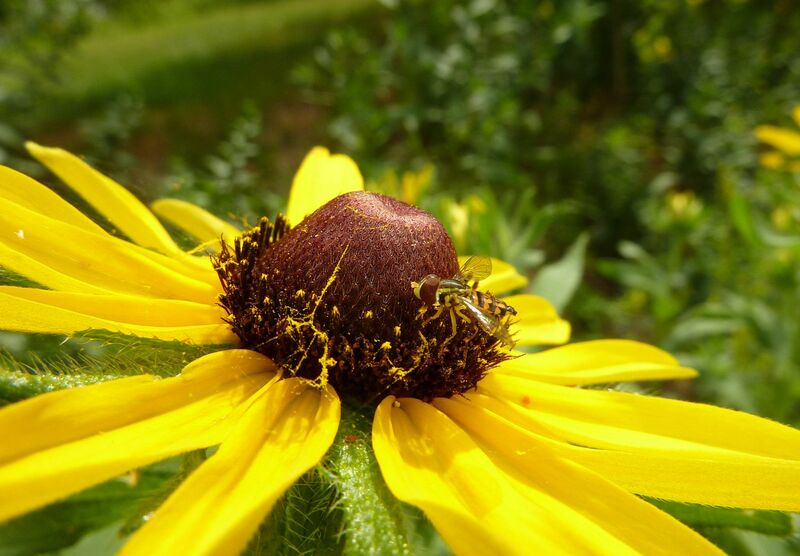 There were a few others like Brown-Eyed Susan too but I honestly can't tell the difference. You can tell from the silky threads on the flower that a caterpillar of some sort has inhabited the plant. 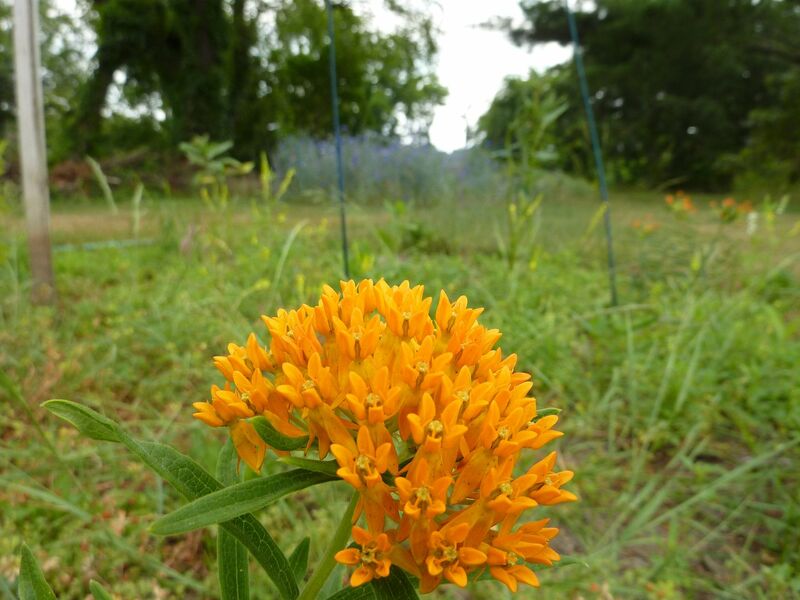 Similar to Milkweed Rudbeckia are host to a number of Lepidoptera. The issue is they're all small and nibble mostly on the flowers. They're no where near as showy as the Monarch either. The Hover Fly was dead center when I took this shot I swear. It darted just a bit to quick for me but still came out in perfect focus somehow a few inches to the left. The only real plant I don't have a lot of was the Spiderwort. There was loads of this in the front garden and the bees were working it fair enough. I want to say planting more of this would help fill the gap in bloom between spring and summer.